Baker Books has launched a new commentary series called “Teach the Text.” Nowadays, with the proliferation of commentary series, one may wonder what “yet another” series can offer. But, actually, their angle is useful. The focus, as you can imagine, is on how preachers and teachers can “Teach the Text.” So, everything is streamlined with a view towards helping text-teachers do their work competently. -Chapters are kept short (six pages) in order to make them manageable for preaching and teaching units. I really like this, and as I read through a sample commentary, it did not feel forced. -In each mini-chapter you have the commentator start off by offering the “big idea” of the passage. This is a huge boon for preachers and will help them stay focused on the meaning of the text, not little rabbit trails or theology hobby horses. -Then the first page or so of a mini-chapter offers background historical and literary information on the passage. Usually nothing earth-shattering here, but just enough to orient you to the who’s and what’s and when’s of the context. -Next, the commentator offers key “interpretive insights” on the passage (not exhaustive verse-by-verse, but selective comments). This is the kind of thing you expect to find in a traditional commentary. Sometimes this felt a bit sparse, but, given the focus of the series, the commentator surely could not do much in this section without squeezing out important items in other sections. -After that, you will find a “Theological Insights” section where key theological ideas in the passage are discussed. This is a kind of “thinking big picture” part. -Then you have “Teaching the Text” suggestions. This is one of the best parts. You get expert advice from the author regarding how to approach communicating the meaning of the passage. The volume I looked at came across very conversational and informal, like the author was thinking out loud (you could even imagine with a tape recorder). I found that very appealing. -Finally there is the “Illustrating the Text” section. This is a short, but priceless, portion that offers a variety of ideas for how to help modern readers think about the implications and applications of the text through art, poetry, exercises, discussions, and liturgy. -The text is peppered with beautiful pictures and photographs that stimulate the imagination. 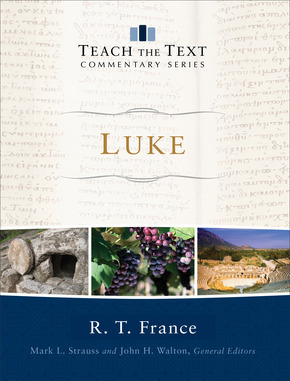 Recently I perused R.T. France’s volume on Luke. France, former principal of Wycliffe Hall, distinguished himself as an expert in the study of both Mark (NIGTC) and Matthew (NICNT). In fact, I am currently having my students read his Matthew volume. His work on Luke, then, proves itself to be well-informed by a lifetime of study on the Synoptics. One important thing about this series. It will be only as good as the scholars who bring their expertise to the table, not only in advanced exegesis (which undergirds their study), but also particularly in synthesizing the material and offering sagacious pedagogical advice. France’s volume is exemplary. If you buy this volume, it is as if you hired the author (France, sadly, passed away recently) to consult with you on preaching. Imagine meeting with the author weekly to talk through the passage and your sermon. This commentary feels and reads in just such a way. In the “illustrating the text” section, France is so well-read on art and culture that his advice is nearly worth getting the book all by itself. One of my favorite parts of France’s work is his “big idea” sentences that begin each chapter – these are always succinct and spot-on. Whenever I have my own students do exegesis papers, I always require them to work up a “synthesis” statement in their conclusion where they condense the “big idea” of their passage in one sentence (I had this part of the assignment before the commentary series existed, I swear!). Well, I found France’s work so precise that I will pass around this commentary so my students can see excellent examples of what synthesis statements look like! This is now the third France commentary I own, and I am very grateful to have this in my library. I also own the Romans volume by C. Marvin Pate. I haven’t cracked the spine yet, but I will say a few words about it when I do. Next postMake Shelf-Space for More “Old Testament Pseudepigrapha”! May the dear man RIP. I was assigned his Mark volume (NIGTC) for a CUME class. At the time I thought the idea of assigning every page of a commentary was a bit over-the-top, but that commentary brought me to tears several times. And that was a technical commentary! Amazing guy.